Congrats to Catherine. Love those horse' faces. Great job. Happy PPF to all. Have a great weekend..
Catherine's art is beautiful...I feel blessed to own a few pieces!! Congratulations being featured Catherine! oh, this is beautiful work! I'm missing where the challenge is posted-is this a new thing to PPF? Where would it be? Thanks again for hosting! Catherine, your horses are exceptional, especially love the spotted hind quarters! And to my hostesses, thank you for another opportunity to share my art here! Love these beautiful appaloosas! Great work, Catherine. Catherine, a very bold and beautiful piece! Those beautiful animals remind me of a merry-go-round from childhood, I always wanted to sit on the white horse! Awesome work, Catherine. Beautiful appaloosas! Great work, Catherine. 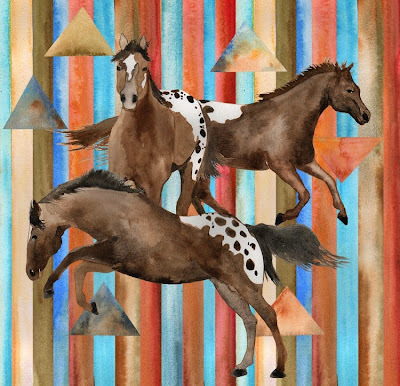 What a beautiful painting Catherine - I love the striped background against the wonderful movement of the horses. This is a great piece Catherine, it feels full of joy and life! Super painting, Catharine, unusual with the stripes. I'm not familiar with Catharine, but I certainly like her work. Blessings! beautiful painting-that background reminds me of a southwestern blanket! Happy PPF everyone! the horses on this background are beautiful! great work, Catherine! Beautiful horses -- it's dream like, horses emerging from the stripes like when you drift into dreams. My latest post is a book review of Danny Gregory's new book -- great inspiration for new and practicing artists.